Venus in Pisces: dancer Anabel Veloso in a promotional photo for the 2009 Deje Flamenco production Nacidos del Mar. More info below. We’re in an enchanted period in which all the planets are direct. It doesn’t happen very often and it won’t last, so make it your mission this week to move full-speed ahead toward what you most want in life. I’m not saying that what you want is going to fall out of the sky into your lap, just because the planets are aligned. A good metaphor is having a strong tailwind on a long and perilous journey. We can cover a lot of ground in a short time, with minimal complications. Even if you have a serious affliction in your chart right now – for example, if Saturn is conjunct your natal Pluto – you will be surprised by how little resistance you meet. Chances are, something important happened for you around the New Moon on Christmas Eve. Whatever it was, the Full Moon on Monday will bring resolution. Again, this doesn’t mean that everything is going to work out exactly as you want … or, to be more precise, the way you have been visualizing. A new element has been introduced into the situation, possibly a game-changer. What does appear to be happening for my clients and just about everyone I know is that circumstances in their lives are linked to something that was going on in the summer of 2010, during the height of the cardinal T-square. The New Moon on Christmas Eve revisited critical degrees of that configuration. The difference now is Saturn and Jupiter no longer are squaring Pluto. Indeed, Jupiter is in a favorable sextile and will remain so for the rest of the winter season (summer for our friends Down Under). That’s another reason I’m so keen on these next couple of weeks. The Full Moon also makes a favorable angle to Mars in Virgo. Mars is slowing down in preparation for turning retrograde on January 23. The closer we get to that date, the harder it’s going to be move forward with plans and projects, so it’s even more important that you not waste any time this week doing what needs to be done. A little effort will go a long way. Events related to the Full Moon continue to unfold throughout the week. On Thursday, the Sun forms an exact trine with Mars. This is not an impulsive combination, but a signal to make detailed plans in an organization manner. Once you do that, following through with action will be much easier. It’s sort of like writing a term paper. If you just start writing with no idea where you want to go, you end up with an overwhelming mess. However, if you make an outline and start filling in the details, the process is much easier and more effective. The following day is Friday the 13th, which is not to be feared but celebrated. Far from being unlucky, 13 is a special number. Among other things, it’s the number of cycles in a lunar year. Friday is named for Freya, the Norse equivalent of Venus. As it turns out, planet Venus is busy on her day, making contacts with Saturn and Neptune before entering mystic Pisces, the sign of her exaltation – anything but unlucky! The Venus-Saturn trine is perfect for making and renewing commitments, be they to another person, a career choice, lifelong goal, or a commitment to do something for yourself. Later in the day, Venus conjoins Neptune. Astrologers normally caution with this pair that we can lose a grip on reality. However, with Saturn in the picture, I think it’s far less likely. To the contrary, whatever commitments we enter into, we should be able to enter with eyes wide open. The conjunction with Neptune is the last aspect Venus makes before gliding into Neptune-ruled Pisces. This is Venus at her best, highest love. Compassion and understanding take the place of selfish needs and demands. Once she’s in Pisces, the first contact Venus makes is a sextile with Jupiter in Taurus, the sign she rules. Love with no strings attached can move mountains. P.S. If, like me, you’re curious about how this incredible photo of Anabel Veloso was shot, watch this video on YouTube. 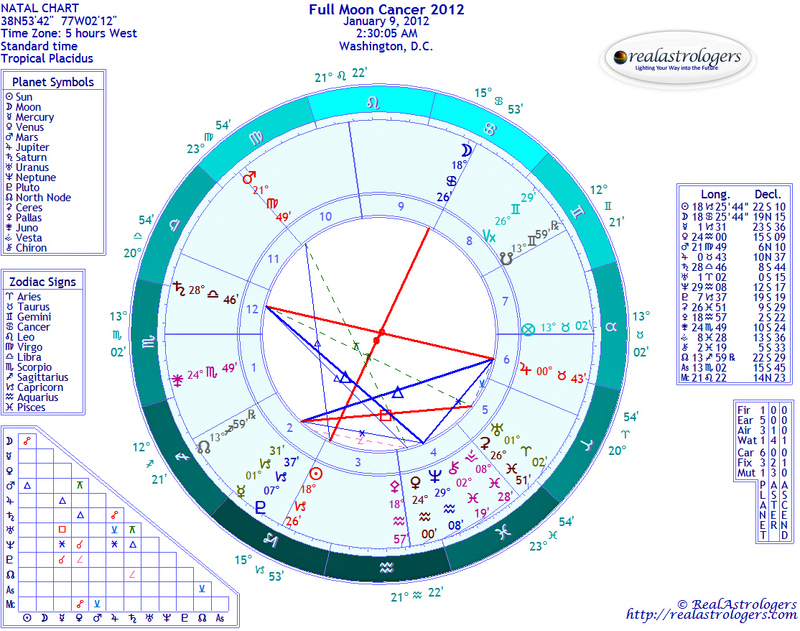 This entry was posted in Forecasts and tagged cardinal T-square, Full Moon in Cancer, venus in pisces, Venus trine Saturn on January 8, 2012 by Pat. This Full Moon brought an ending to my agency. We’ve been struggling to bring in revenue, and 2011 was a bad year for us. The director/owner has no choice but to let us fold in order to save the other programs. I’ll be looking for work in the next month or so. We may be absorbed by another company that does the same type of work, so all is not lost. I was chafing and wanting to split anyway, so this is an opportunity, altho the Mars rx may create resistance. We’ll see!